If your business used a previous accounting system before Pandle, you will need to enter Opening Balances. This is when you would choose a date to stop using your old system and start using Pandle. On this date, your old system will have closing balances, usually in the form of a Trial Balance report. These balances will be things like the value of assets, bank balances, loan balances etc. These closing balances are also used as Opening Balances in Pandle, so it's important to ensure that the bookkeeping completed on your previous system was correct and complete up to that date. What date should I start using Pandle? While anyone can begin using Pandle on any date, there are certain dates that work better depending on how your business trades. Starting from a new financial year (usually 6th April for sole traders, or the day after your year end on Companies House if you have limited company) is usually the best option as it means your bookkeeping is not across two systems when preparing the accounts/tax return. However, if your business is VAT registered we would strongly advise that you start from the beginning of a new VAT quarter to ensure VAT calculations are correct in Pandle. If you start during a VAT quarter then you will need help from a professional to ensure the first VAT return in Pandle is submitted correctly. We've made this quick video which will run you through how to enter your opening balances in Pandle. To enter Opening Balances in Pandle, go to Tools > Opening Balance Wizard. You will then be presented with the Opening Balance Wizard, pictured below. The first two steps instruct you how you can add customers and suppliers to Pandle (if you haven't done so already). You only need to add the customers and suppliers who you owe money to (creditors) and who owe money to you (debtors) at the date you're starting to enter transactions in Pandle. If you have lots of customers/suppliers to add, you can import them all in one go by heading to Enter Transactions > Customers Tab/Suppliers Tab. If your business is VAT registered then you will need to supply your VAT details. You may have already entered this information when setting up Pandle originally but if not, you will need to enter it now. 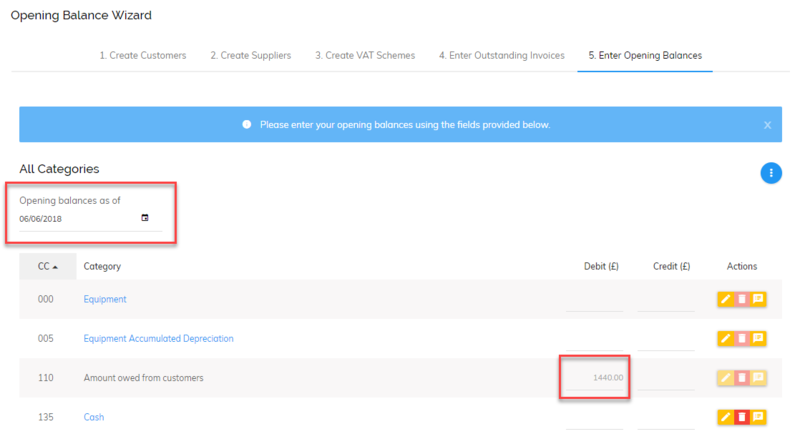 It is important to get the VAT settings right at this stage so that Pandle knows how to calculate the VAT correctly on the Opening Balance Transactions, such as in the amounts owed from your customers. You will then need to change the outstanding amounts to the same date you began entering transactions in Pandle. If you were neither owed money from debtors nor owed money to creditors, you can skip this stage. If money was owed then all invoices which make up the amounts owed will need to be entered here. You can enter customer and supplier invoices here by changing the 'Type' of transaction on each row. The final step asks for the remainder of your Opening Balances, which you can take from the trial balance of your previous system. You will notice that the amount owed from customers and amount owed to suppliers have been populated for you. These amounts should match those on your closing trial balance - if they don't match you will need to go back to the previous step and correct the invoicing entries. Please ensure that the date entered (highlighted above) is the start date transactions are being entered from i.e the day after the closing trial balance date. Opening Balances can sometimes get complex depending on your previous system and how many balances you have. Therefore if you have any doubts it's always best to ask your accountant.